Hello! Are you checking off all those to do lists? 7 days till Christmas. Say it ain't so! Every year it goes faster. I have a couple of fun cards to share with you made for RRR. First up this cute "farmhouse" style Christmas card. I kept it simple letting my embossed frame and star take center stage. I used a process using bleach and vinegar to rust my metal star. I used red seam binding for my ribbon. on both cards. The second card I decorated the inside! Well that is it for me, I am gonna go check off more things off my list! I can't believe I am saying this, but time for another RRR. 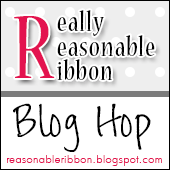 blog hop folks!!! I have not gotten to say that for awhile!!! You should have found your way here from Kathy's blog. If at any time you find yourself lost, just start back at the RRR blog link up above. 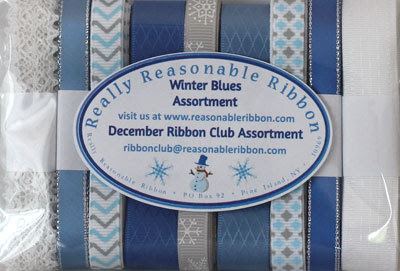 Here is this month's ribbon club assortment. Here is my card! A cute Wintery greeting with the cutest owls! I embossed my sentiment and my large snowflake for some added detail. I also added some white bead berry spray clusters to the center of my bow along with a snowball. Here is my card finished. I love this color combination. Thanks for stopping my friends! Your next stop is onto Sheila's blog. Have fun and be inspired! Hello my friends! It has been along while since I have posted. I have had some health issues along with other social media things taking up my time. I am in the process of creating a new blog which will be over at Wordpress. I am back to being creative, both in my home and in my art work. Which feels wonderful! I wanted to pop in and share a fun project. If you have followed me through the years you know my heart lies with nostalgic retro images. This could be my favorite snowman ever!!! I used a gorgeous chipboard frame from Gypsy Soul Laser Cuts. I heat embossed it with gold embossing powder. Love the antique retro look. Happy Spring! I have a fun 3d project to share with you all. I lost half a Sunday assembling and creating this and it was so enjoyable. Don't you love getting lost in art? I started with the Standing Flip Book. This kit comes with several chipboard pages but I used only one and decorated both sides of it. So Depending on your mood you can switch out what side you want to see. I painted the whole flip book first with white acrylic paint. I added borders to both sides of the flip book. I added ribbons to both sides and added my main focal points. I assembled my cute tag that I attached to my rings. I distressed the flip book all over, especially the edges. Here is my project completed. Isn't the mini house adorable? I have a fun card to share. I used the Swiss Dots Primary assortment in satin. A fun selection of polka dots. I think this card heralds in Spring quite well! Hi folks..popping in today for the Cheery Lynn Blog. I have a shaker card to share for a birthday. Happy Saturday! My day over at the Cheery Lynn Blog! While it's snowing here ....my card to share shows otherwise. Full of puffy clouds and sunshine! My day at the Gypsy Soul Laser Cuts Blog. I created a fun bee card to share. I started by embossing the Flourish open circle frames and stackable labels shapes. Than covered my card in papers and stamps. From here I added ribbon.